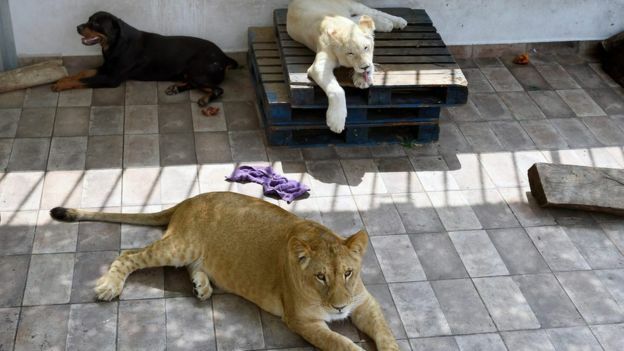 A man in Mexico City is refusing to give up the three lions he keeps on his terrace. Federal inspectors say the trio should be moved into more appropriate care. Their roars have caused concern in the highly built-up area, according to local media, and neighbours have voiced their complaints on social media. Omar Rodríguez says he keeps them because he wants his grandchildren to get to know the endangered white species, says El Universal newspaper. "I know that maybe these are not the best conditions," Mr Rodríguez told AFP news agency. "The best condition for having a lion would be on the African savannah, where it could run freely, but you know…"
He says he has kept lions for 20 years and he has appropriate paperwork from the Profepa federal environment agency. However, the authorities say he has not provided this, and the animals' living conditions are not suitable. Mr Rodríguez has been told to allow inspectors to visit his home in the Colonia Asturias area on Friday, or the case may be referred up to the attorney-general's office. He has also been asked to provide documentation on the lions' origins. Hillary Clinton lost her security clearance because of her email scandal. It's about time. Well, so what, in the Trump administration you can already lose your security clearance because you don't praise Donnie hard enough ... or because someone sows the unfounded (and false) rumor that you gave any informations to the press. All hail the orange emperor. He wants to be like Emperor Palpatine, but lacks any sort of real brains. And he lacks clothes too. All the orange emperor troll with no clothes! Funny enough Kid (once again) doesn't tell the whole truth. It was taken from her as the result of the investigation. And investigation? What was the result of that? Oh that's right. Millions of dollars wasted on nothing. Kidiot. Nothing more than a dog and pony show. Last edited by Giancarlo; October 12, 2018, 22:37. Kid is right in a round about way ... if it hadn’t have been for opening the investigation again publicly right before the election, she may well be President and thus not have asked to have her security clearance revoked. I'm right in a direct way. She requested to have her clearance revoked because it was going to be revoked. That’s still round about even if true. Direct would be if it was taken from her. I said she lost it and she did. You all are being ridiculous. Cognitive dissonance. The truth is so painfull. more dumbass ramblings from kidiot. You said it was taken from her as a result of the investigation. It was not taken from her if she requested it be rescinded. Neither did she lose it. Words have meanings. And germany "traditionally" has a large muslim population (relatively speaking, absolutely it is less than 6% of the german population) thanks to a large immigration wave from turkey after WW2 (when germany desperately was seeking for immigrant workers) ... it is quite normal to have Shisha bars in the cities and to have no problems in finding a Döner-Imbiss. Didn't we have this conversation with festivals and things like Oktoberfest getting shut down for being offensive to Muslims? There's a reason Merkel is pushing for immigration and it's not because she's got the best interests of Germany at hand. Do they also talk about the 'no-go' zones like they have in Sweden and France? Or is that something that you're not allowed to talk about? You mean these fake news? A petition that was started by some troll from the netherlands, created on a US petition website and receiving just a few hundred signators. A petition that even doesn't exist anymore (I guess it was taken down). Last edited by Proteus_MST; October 13, 2018, 05:44. All times are GMT-5. This page was generated at 18:30.